Normally I’d be on to something else, but I thought all y’all Celestron NexStar 11 fanciers might like a Part II, an update on last week’s subject, on how the ol’ gal is making out these days. 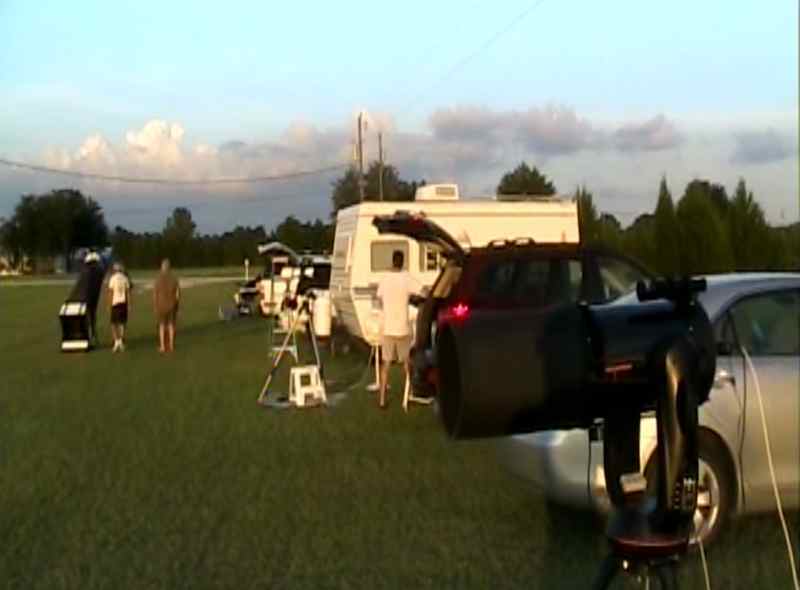 Not that I’d planned on taking Bertha, my NexStar 11, down to the Chiefland Astronomy Village. What I intended, muchachos, was a good run with the C8, Atlas mount, and DSLR in hopes of getting some images for a book I am vaguely planning, Uncle Rod's Deep Sky 100. Chiefland, Florida, as you might guess, is not an overly comfortable place to be in the summertime. It's only about twenty miles from the Gulf of Mexico, but it is still inland, and on July afternoons it is indeed just like an oven. On the other hand, it’s my prime dark sky imaging site. I was ready to brave the conditions, which can make even Possum Swamp Julys feel cool, for one reason: I needed pictures of the summer sky objects, and I had few recent ones of these due to the unpleasantness of Possum Swamp (and Chiefland) summers. The original plan was to scoot down for the June new Moon in hopes of missing the worst of that heat. ‘Twas was not to be; I outsmarted myself. I thought what I’d do would be make motel reservations the Monday before the new Moon weekend, when the Clear Sky Clock and Wunderground would give me some idea whether it would be go or no-go weather-wise. On Monday afternoon, the weekend predictions were not outstanding, but it looked like I might squeak by with a few hours, so I got on the Web to make motel reservations. Uh-uh, nosir buddy. Believe it or no (and I still have trouble), every blankety-blank motel room in Chiefland, or even near Chiefland, was booked-up. Orbitz did no good. Calling on the phone did no good. Why this should be, I have no idea. Does Chiefland have a Watermelon Festival or something? Do the manatees come out to play in nearby Manatee Springs in June? 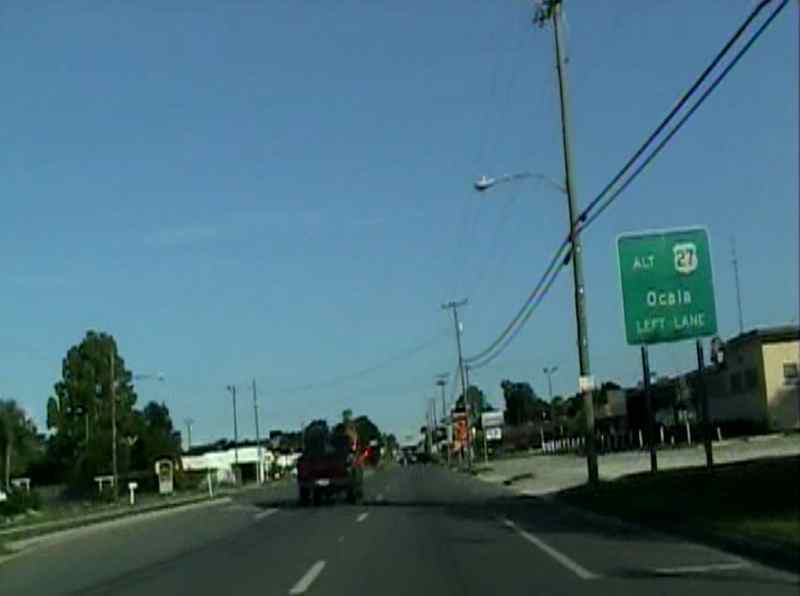 Do some Disneyworld-bound tourists still cruise down Highway 19? Dunno, but I had no intention of doing something stupid and tent camping on the observing field. As I noted last time, doing that once in May was enough. I can scarcely imagine how uncomfortable a tent would be in the June heat. Well, I’d do July instead, then. So as not to outsmart myself again, I immediately made reservations at the Holiday Inn Express for the weekend of 24 July. I kept a close eye on the weather reports, natch, and, sad to tell, the closer it got to the New Moon, the worse they became. I decided that if the predictions weren’t any better than “40% cloud cover at night” on the Thursday night preceding my departure, Atlas and C8 would stay home. That would be a shame, as I was anxious to try out what I thought would be a winning software combo: EQMOD and SkyTools 3. A short test run had assured me that SkyTools was a real good match for the Atlas’ EQMOD driver, but I wanted to get down to some serious work with that combo and also throw PHD Guiding into the mix. Alas, by Thursday I did indeed decide to switch gears. The DSLR and SBIG would stay behind. I still wanted to get some images for the book, however, and the best way to do that in an environment that would, I reckoned, be Sucker Hole City would be with the Stellacam II deep sky video camera. The Stellacam has the advantage of being quick off the mark. No darks. No flats. No long strings of sub-exposures, no exacting polar alignment. No polar alignment at all, in fact. I’ve often used the Stellacam with the NS11 in alt-az mode and it works very well, and that was what I intended to do this time. No, the pictures you get with a deep sky video camera ain't exactly on the "pretty" side, but I thought they might suffice. So it was that Friday morning I crawled out of bed to partly cloudy skies but with some hope still in my withered li’l heart, loaded up Bertha and all the tons of ancilliary gear I tote along and hit the road. As has often the case on my recent Chiefland expeditions, I was by myself for the six-and-a-half hours of unrelenting boredom of the drive down. The presence of my iPod Touch loaded up with Stephen King’s Dark Tower 3: The Wasteland made my trip across the unchanging I-10 landscape (not quite wasteland) of the Florida panhandle at least bearable. Weather? I ran through a couple of serious thunderstorms west of Tallahassee, but once I turned off the Interstate to pick up Highway 19, the rain stopped—though the clouds didn’t seem to want to outright disperse as they sometimes do as I near the CAV. Arriving in Chiefland proper about 3pm, I followed my usual leisurely itinerary. With sunset not until 8:30pm, there was no need to rush. 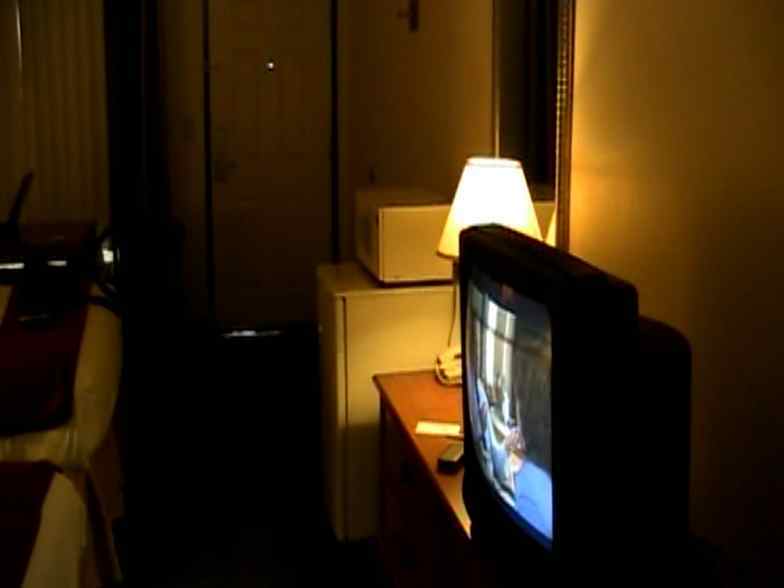 I checked into the motel, which was as clean and comfortable as ever, though, as is sometimes the case with small town motels, now assuming a somewhat tired appearance. More than adequate for this ol’ boy, needless to say. Once I’d unpacked in the room, I headed out to the site to get set up, and, believe me, I was happy to have passing clouds occasionally cover the Sun. H-O-T. The heat wasn’t just pouring down from ol’ Sol, it was being reflected by the grassy field and into my face with a vengeance. I worked slowly and deliberately to get my 66-pound girlfriend out of the car and on her tripod, my EZ-up canopy erected (with some help from one of my CAV beaudreauxs, Carl Wright), and the computer, DVD recorder, monitor, and various and sundry items positioned. Where did I set up, exactly? 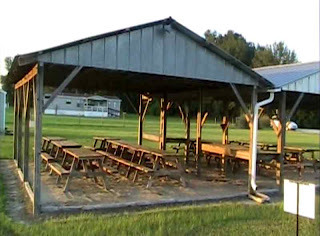 Chiefland has a big new field, but I am used to my old haunt, the “club field,” or “old field,” which is now officially known as the “Billy Dodd Memorial Observing Field” in memory of one of Chiefland Astronomy Village’s founders. I am sure the new area is nice, but I am a creature of habit and am most comfortable with “the same” not “different.” By the time I finished my work, I was drenched with sweat. What a joy it was to hop in the car and luxuriate in the a/c as I headed back to the motel for a nap. After a few hours of dozing in the blessedly cool dark of my room followed by a stroll through the Chiefland WallyWorld for vital provisions (Jack Links, Monster Energy Drinks, bottled water), I headed back to the CAV—at about 7pm—to the accompaniment of Greg Allman's "Midnight Rider" cranked on the radio. I felt good. Once I’d got out of the car and taken a look at the sky, I began to feel even better. In typical Chiefland fashion, a huge blue hole had opened. Any remaining clouds were off to the north and east, and were obviously sliding past the site, not toward it. I was still suspicious, mind you, since this weather pattern seems to have become less common of late, but by sundown the sky had continued to improve. There was some impressive lightning flashing from thunderheads to the east, but they was low on the horizon and moving away. First order of bidness, with the brighter luminaries now beginning to put in their appearances, was getting the NS11 go-to aligned. I flipped the Big Switch to “on,” booted NexRemote on the laptop, and located my Wireless Wingman Joystick. I’d already affixed the Stellacam and a Meade f/3.3 reducer to the rear cell and had powered up the DVD recorder and the li’l portable DVD player I use as a monitor. 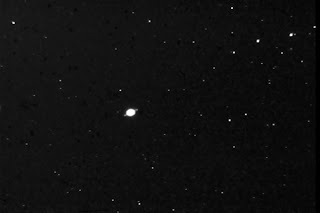 I set the Stellacam to expose “live”—30-frames-per-second—and began the GPS alignment, the old style north and level procedure that’s possible with my old scope. Bertha did her dance, got a quick GPS fix (in just a few seconds despite the fact that the last time I’d used her had been from a location hundreds of miles away), and headed for the first of two alignment stars. All I had to do at the scope was peer through the finder, center the stars in it, and then center them on the monitor. I was close to focus, but if I hadn’t been, lengthening the exposure time with the Stellacam will usually reveal even the most out of focus sparklers. I finished to the accompaniment of a couple of onlookers’ chuckles. 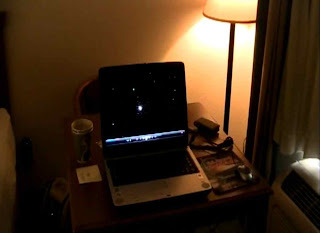 They was tickled by Bertha’s “voice” (thanks to NexRemote): “Center Star in Finder and Press Enter! Alignment Successful!” Before anybody gets huffy, let me say that I keep the volume low to avoid disturbing my neighbors on the field. My buddies had wandered over to get a look at a NexStar 11, which, I was surprised to realize, is becoming something of a rarity and an antique curiosity. Scope aligned, next thing on the agenda was getting focus tweaked-in. I did this by the simple expedient of walking over to the scope, nudging the focus control, walking back to the monitor and observing the results, and repeating as needed. Yeah, I know, HOW PRIMITIVE! I do have a moto-focus for the C8, and I am gonna get a kit to adapt it to Bertha “soon.” I might even buy or make one o’ them new-fangled Bahtinov masks. What did I focus on and how? My procedure is to make the alignment star the telescope is sitting on as small as possible, up the exposure, and do the same for dimmer field stars. Final tweak? 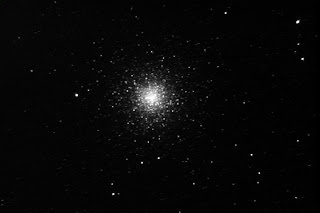 Over to glorious M13. No better object to focus on than a globular star cluster. Once focus was “in,” I was done messing with the scope for the evening. The carbon fiber tube kept images sharp for the rest of the night, keeping focus killing tube expansion and contraction to a minimum. I was able to stay under the EZ up with the computer and the video monitor the whole time, remaining relatively dry during the moderately heavy (though not at all bad by deep south standards) dew "fall." Final pre-flight actions? I fired up my Thermacell bug repeller. Chiefland is not usually troubled by mosquitoes, but there had been considerable rain over the last few weeks, and I was being nipped at by skeeters and the occasional noseeum. The Thermacell quickly ejected these miscreants from the EZ Up. I then turned on a little fan so I'd have some semblance of a breeze blowing in my hot face, and I was good to go. There was one other thing to do before me and Bertha could get rolling: run SkyTools 3. Even though I wouldn’t be able to try the program with EQMOD, I’d still be able to enjoy its benefits. With NexRemote up, you assign a virtual port to ST3, and it works sweet, sending your telescope on its slews jus’ like you were using the “real” HC. Sure, I could have put together a tour of the evening’s objects using NR’s NexTour module, but it is SO much easier to use lists composed with SkyTools. There really is no comparison. I set NexRemote’s HC display to “always on top,” linked SkyTools 3 to the scope, and was ready for the evening’s deep space adventures. Before clicking to the first target, M17, I poked my head out from under the canopy and took a look at the sky. For a moment, nonplussed was I. What were those clouds doing all across the East? It only took a moment to realize I wasn’t seeing the undersides of clouds illuminated by light pollution; that was the Milky Way, just blazing its heart out. I won’t hesitate to say the skies on this supposedly “iffy” night were some of the best I have ever experienced at Chiefland. A glance southeast, to the tail of the scorpion, revealed the constellation’s famous “false comet” asterism. The last time I’d seen it as clearly was about a decade previous from, yes, Prude Ranch. Not wanting to waste this loveliness, I set to work with Bertha. What was way-cool over the course of the evening? I might mention that monstrous glob, M22; it was a giant globe resolved right across the core. Or M8, the Lagoon, which literally filled the screen with nebulosity and fiercely burning young suns. The big hit for me on Friday, though, was NGC 7009, the Saturn Nebula. Hail yeah, I’ve seen this thing hundreds—if not thousands—of times over the last 44 years. And it has often looked right good. In Carl's beautiful 22-inch Star Structure Dob set up next to me on the Chiefland field, it was nice. Wonderful even. It was a striking blue color, and, with averted vision, the “ring”—the ansae—were visible under the steady seeing we were enjoying. Nice as it was in the big Dob, it didn’t prepare me for what I saw when I sent Bertha over Aquarius way, and the little planetary popped onto the screen. “So THAT’S why Lord Rosse called it the ‘Saturn Nebula’!” Frankly, I sat openmouthed for a while. The nebula looked almost exactly like what I remembered Saturn looking like in my Palomar Junior in 1966 when the rings were edge on. I had never seen the nebula's ansae this prominent. But, then, I’d never turned the Stellacam loose on NGC 7009 under excellent seeing before. A little squinting, and I could make out an outer envelope, detail in the disk, and the round “fliers” at the tips of the ansae/rings. And that’s the way it was, muchachos, I’d click on an object in SkyTools 3, Bertha would announce “slewing to target,” I’d push the “record” button on the DVD remote, and another beautiful object would be in the can. That’s the way it was until about 1:30, anyhow. 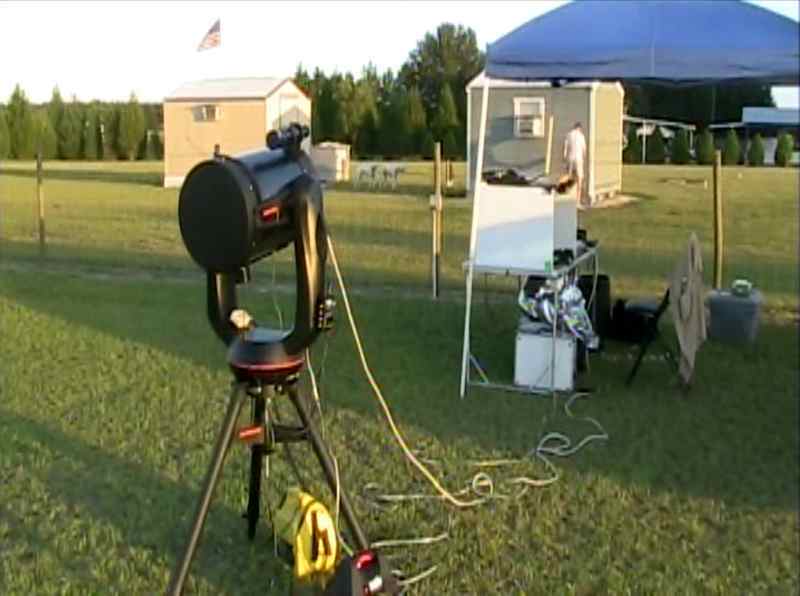 By then, I’d replaced the Stellacam II with a NexImage camera in hopes of capturing the new Jupiter Impact. As I was focusing up, I noticed the level meter on K3CCD Tools, my planetary image capture program, dipping precipitously. What the—? I walked out from under the canopy and looked to the east, “Dadgummit!” Clouds, plenty of clouds, real clouds this time, had begun to move in. That is a not an unheard of occurrence in the wee hours at Chiefland. It will be clear all night, clouds magically drifting around the site; then, after midnight, they—or ground fog—will suddenly blow in from the east. Was I a little put-out? You betcha. Was it a tragedy? No. I’d had four hours of outstanding conditions, and, truth be told, I was a mite weary, having arisen at 6am and then driven over 6-hours. Warn’t nothing for it nohow. By the time I was back on Highway 19 and headed for town, rain had begun to fall. Back at the motel, a shot or three o’ the Yell, a little cable TV, and I was in dreamland drifting through electric-blue planetary nebulae. Saturday morning? Looked about the same as Friday afternoon. That is, partly cloudy but no incipient rain. I just managed to catch the motel’s free breakfast just before it shut down (love them deadly li’l cinnamon rolls), and spent the rest of the day relaxing and writing. I had intended to pay a visit to the famous Bar-B-Q Bill’s for lunch, but the cinnamon rolls (and the bisquits and gravy and sausage patties) had filled me up, and I settled for a mid day nap. I should probably have stayed put till 7:30 p.m. or so, but I got antsy and headed out to the CAV at around 6. Big mistake. At 6pm, ol’ Sol was still doing his thing with a vengeance. I recovered some bottled water from the clubhouse and took refuge under the site's picnic pavilion till the heat began to ease at 7. With the scope ready to go, I killed the remaining time before dark hanging out with Chiefland friends old and new. I also spent some time deciding what to observe. I’d almost unbelievably run through my whole list the previous night. I thought I’d concentrate, then, on picking up a few early fall Hickson groups I had yet to bag and then doing some DSOs, constellation by constellation, from Brian Skiff’s and Christian Luginbuhl’s Observing Handbook and Catalog of Deep Sky Objects. If I got to see anything. Looking to the northeast in the twilight, we witnessed the approach of a thunderhead that soon assumed the classic and evil-looking anvil shape. Before long, it was writhing with scary-looking lightning bolts. Or almost scary. In typical Chiefland fashion, it stayed off to the east and drifted slowly to the south and out of sight by the time astronomical twilight was done. Too darned bad I hadn’t brought my DSLR with me; the snaking bolts of sky fire were impressive. Second problem? I’d meant to make up a list of Hicksons with SkyTools 3, but in the course of my waffling about which scope to bring and what to do with it, I had plumb forgot. I didn’t have the Skiff/Luginbuhl lists with me either. What to do? I love SkyTools best, I’ll admit; the way it works fits in perfectly with the way I observe. But I also have a lot of respect for Steve Tuma’s Deepsky planning program. It’s been around for a long time—it was one of the first planners out the gate—works well, and has some nice features. One of the nicest is that it comes with a DVD loaded with hundreds of thousands of images. That was a good thing. In general, the pictures SkyTools 3 downloads from the I-net (and caches for later use) are of higher quality than those on the Deepsky DVD, but there wouldn’t be any downloading tonight: the field’s wi-fi was on the blink. The biggest plus, though? I had a Hickson list for Deepsky on the hard drive. A little hunting around turned up Deepsky format lists for the Skiff book, too. I slammed the image DVD into the drive, aligned Bertha, connected Deepsky to the scope, and was shortly happily hunting fuzzies, Deepsky’s pictures (from the POSS) were a real help in identifying some of the fuzzier and fainter ones. What was uber-cool Saturday night? Lotsa stuff. Probably the best of the best was M2. This somewhat subdued Messier glob really comes to life with the Stellacam. The core was odd-looking and fascinating, composed of countless tiny stars arranged in interweaving chains that spilled across the monitor. Even better was Pegasus’ famous NGC 7479, the classic barred spiral galaxy. It wasn’t huge on the screen, but its two graceful opposed arms were clear and strikingly beautiful. What else? While not exactly an eye-popper, I was pleased to be able to detect at least a section of one of my fave Scorpius objects, the huge Cat’s Paw Nebula. Even at f/4, this thing is way too big—well over a degree—to fit in a Stellacam field. I was nevertheless able to capture at least one of the footpad prints of the bad kitty who made such a mess of the southern sky. I pushed on for as long as I dared, touring through Ophiuchus and Cygnus and Aquila and then Pegasus and Aquarius. A couple of times I thought the clouds was about to stage a repeat performance, but by 2am they still hadn’t. Unfortunately, it was at that time that I had to call it quits. I needed to head back to The Swamp in the morning and wanted to get on the road no later than 9am. Reluctantly, I hit the Big Switch and headed back to town. In the morning, I felt like a George Romero zombie despite having called it a night “early,” but not too bad. The drive home wasn’t real-fun, but it was, again, bearable. And the weariness was for damned sure worth it. I’ve been coming down to Chiefland for more than a few years now, and the sky this time out was at least as good—actually probably considerably better—than I have ever seen it. Everything worked. Nothing bad happened. I was able to visit with some of my CAV buddies. I wasn’t at work. What could be better than that?